The tragic midair crash over the Hudson River that killed nine people last Saturday was caught on a chilling home video. The video, shot by a tourist aboard a boat on the Hudson and obtained exclusively by NBC News, captures the moments before and the stunning impact when small plane collided with a sightseeing helicopter shortly after noon that fateful day. Meanwhile, the Federal Aviation Administration is expected to impose tighter visual flight regulations in the Hudson River corridor. Ray LaHood, secretary of the U.S. Department of Transportation, said today that an FAA working group will deliver recommendations within two weeks based on past suggestions from the National Transportation Safety Board. "We're gonna speak loudly. We know there are some things we can do immediately," LaHood said. "But I can't prejudge (the working group). We're gonna get it right." The video, which is sure to provide clues to the NTSB, came to light as it was revealed that the air traffic controller handling the small plane was chatting with his girlfriend on the phone at the time of the incident. What's worse, according to the FAA, is the controller's supervisor was not present in the Teterboro Airport tower at the time of the accident either. Yet, both trangressions are not believed to have played a role in the collision, according to officials. "While we have no reason to believe at this time that these actions contributed to the accident, this kind of conduct is unacceptable and we have placed the employees on administrative leave and have begun disciplinary proceedings," the FAA said in a statement. The NTSB, however, objects to the FAA's statement that the controllers' actions didn't contribute to the crash. "The role that air traffic control might have played in this accident will be determined to the NTSB," the agency said in a statement. The disturbing video appears to show the plane making a desperate, last second attempt to turn to the right to avoid hitting the climbing chopper. The plane then appears to rear end the helicopter. 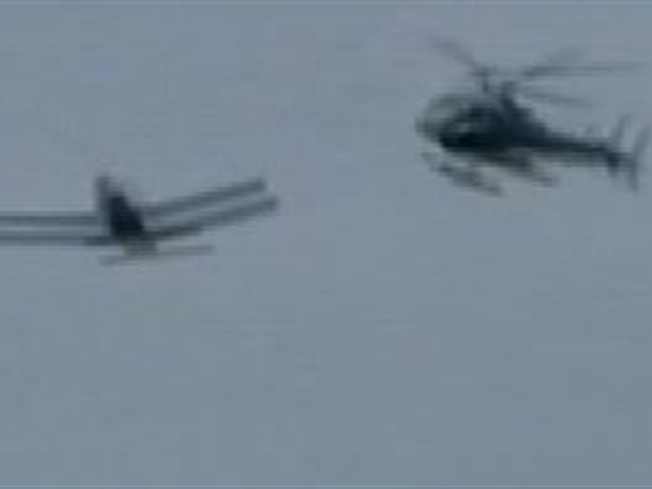 The video shows the plane's left wing striking the chopper's main rotor blades. The left wing then breaks away as the plane flips over and over. The chopper, with its main passenger compartment appearing intact, then plunges into the water like a rock. Nine people died in the crash; six aboard the chopper and three who were on the plane. After the impact, gasps, shrieks and cries of "mamma mia" can be heard aboard the tour boat before the shooter puts the camera down. While still on the phone, the controller handed off the Piper to the control tower at Newark Liberty International Airport, which monitors low-flying air traffic over the Hudson but doesn't actively try to keep aircraft separated, they said. When the plane departed Teterboro, there were several other aircraft in its vicinity, NBC News has learned. But the Teterboro controller had already switched the plane to Newark frequency. By the time Newark controllers contacted the Teterboro controller to tell him to warn the pilot about traffic in the area, it was too late. The Teterboro controller tried to radio the pilot but got no response. Remember, he'd already told the pilot to switch frequencies to Newark control. The controller was still on the phone when the accident occurred. Both towers got an automated warning of impending collision at 11:52:54 a.m. Neither of the controllers remember seeing the alert. The crash occured 20 seconds later. The entire sequence of events lasted only a few minutes. The National Air Traffic Controllers Association released a statement saying, "We support that any such allegation is fully investigated before there is a rush to judgment about the behavior of controller."